I can count on one hand how many ‘wintry’ days we experienced in Los Angeles last year, and by wintry I mean sub-60 degrees fahrenheit. Now don’t get me wrong, it is wonderful waking up to glorious sunshine 360 days a year. But I do like to be able to pull out my winter woolies once in a while. So as soon as there is a nip in the air, I bundle up in warm clothes and station myself at the stove to make copious amounts of soup. 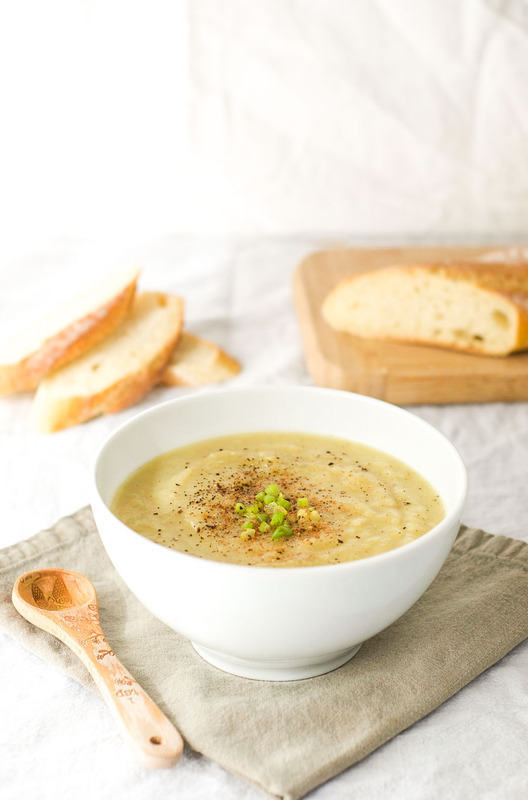 One of my all-time favorites is this incredibly simple leek and potato soup. 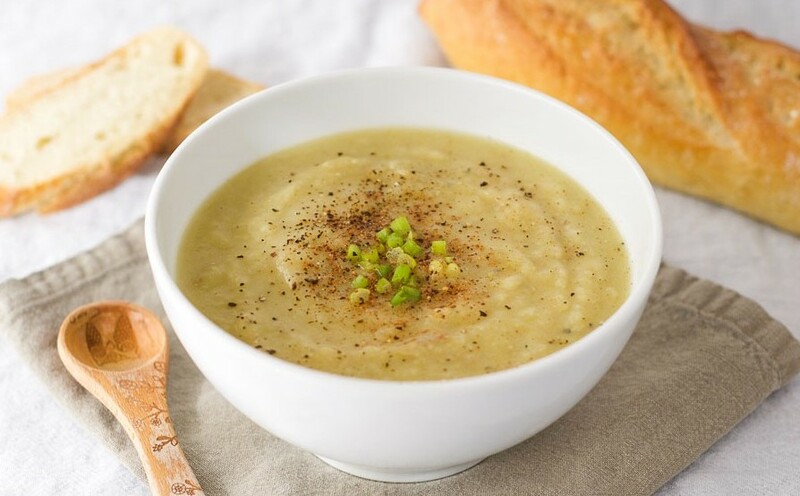 It was with this leek and potato soup that my mum used to nourish us during the long, damp, grey months of winter in the British island of Jersey. She would sauté the leeks in butter, simmer the vegetables in homemade broth, and top each bowl with freshly cooked crispy bacon. On really special occasions we were given chunks of English cheddar to drop into the soup as well. Sadly for my children, I like to tweak recipes to make them healthier. That means they get a less decadent version made without butter or bacon. 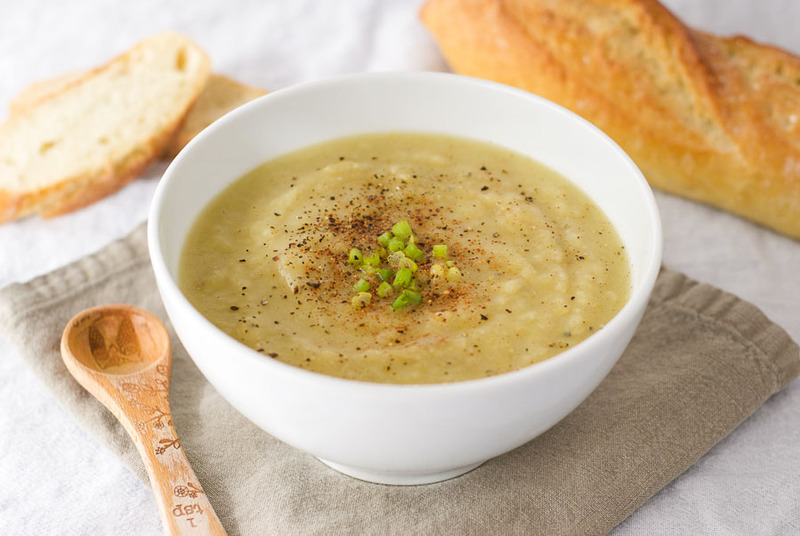 On the plus side, this version of my mum’s leek and potato soup is extremely healthy, has just 5 ingredients, is vegan, gluten free, and still very satisfying. Nutritionally speaking, this is a great health-promoting recipe. The onions, garlic, and leeks all belong to the allium family of vegetables. Higher intake of allium vegetables has been associated with a decreased risk of developing several types of cancer, including cancer of the stomach, colon, and breast. These vegetables are rich in flavonols and organosulfur compounds, which have tumor-inhibiting properties. They have also been linked to increased cardiovascular health, lower blood pressure, increased detoxification by the liver, decreased risk of blood clots, as well as many other excellent health benefits. 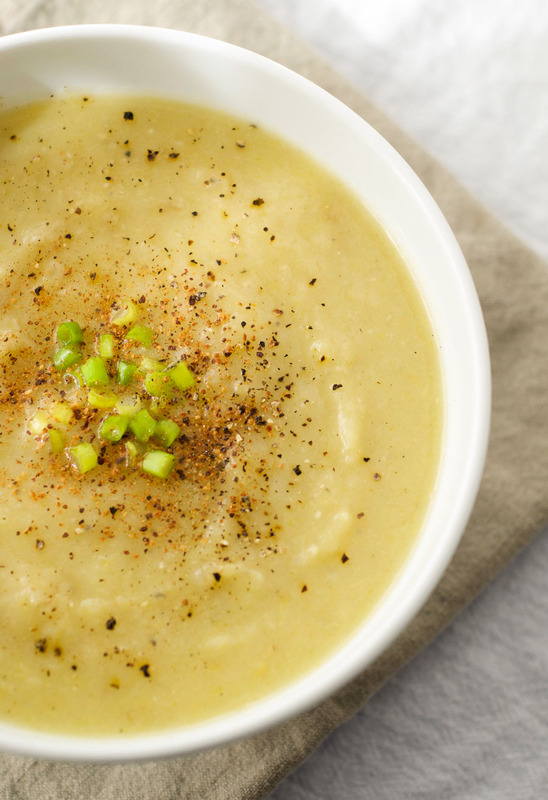 Isn’t it amazing what a humble bowl of leek and potato soup can do? Heat 1 tablespoon olive oil over a medium heat. Add the onion, garlic, and leeks, stir, and cover. Cook gently until soft and translucent, about 8-10 minutes. Chop the potatoes into 2" cubes and add to the pot along with the vegetable broth (keep the skins on the potatoes unless they are really thick). Season with salt, pepper, and a sprinkle of nutmeg to taste. Thanks Dawn. It is incredibly easy – one of its best attributes! Looks very hearty and tasty! Thanks for sharing!